Saw my first robin while out for a walk yesterday. Some juncos and a young male goldfinch came to our feeders too. Wintery weather is still hanging on though. It snowed and there’s a skiff of the white stuff on the ground this morning. It’s not going to get above freezing today unfortunately. We tried to buy a bag of sand to help with traction on our frozen icy driveway but couldn’t find one for love nor money. At our age the fear of falling and breaking a hip is very real. 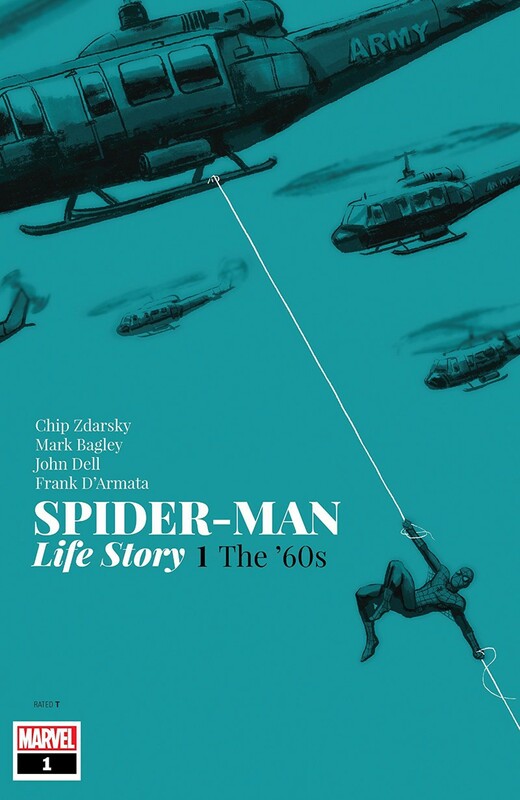 Spider-Man: Life Story #1 – Chip Zdarsky (writer) Mark Bagley (pencils) John Dell (inks) Frank D’Armata (colours) VC’s Travis Lanham (letters). Back when the House of Ideas had neat ideas they put out a comic book called “What If?” that took their famous super heroes and changed major stories around to see what would have happened. This new Spider-Man book feels a lot like that, rather than telling stories filling in gaps from old issues. It’s 1966 and Peter and Gwen are not a couple yet. Flash Thompson is going off to fight in the war in Viet Nam. Chip wasn’t even born yet but he captured the sentiments at the time and Mark got the looks right. Peter meets an arch enemy face to face for the first time and secrets are revealed. What makes this feel like a “What If?” is another possible secret coming out that surprised me. If you’re a true blue and red Spider-Man fan like me I think you’ll like this. 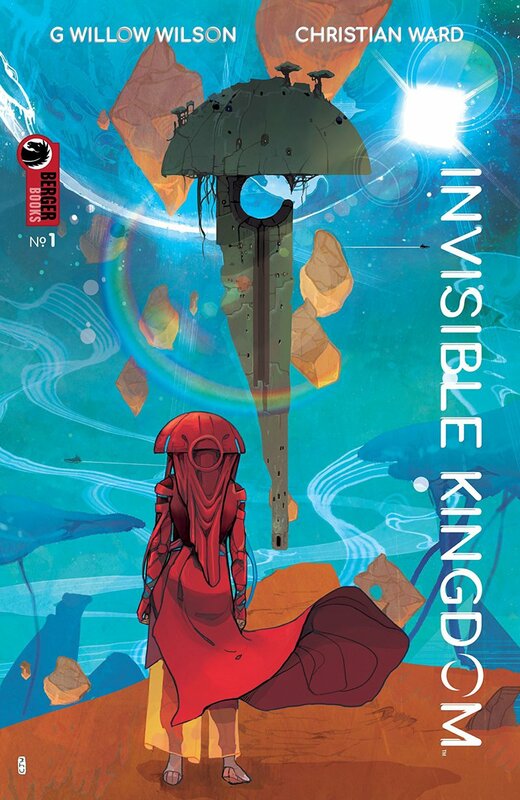 Invisible Kingdom #1 – G. Willow Wilson (writer) Christian Ward (art) Sal Cipriano (letters). I picked this off the rack because I liked what G. Willow Wilson did when she was writing Ms. Marvel. Here she presents a sci-fi story about religion and big business with two very different female leads. 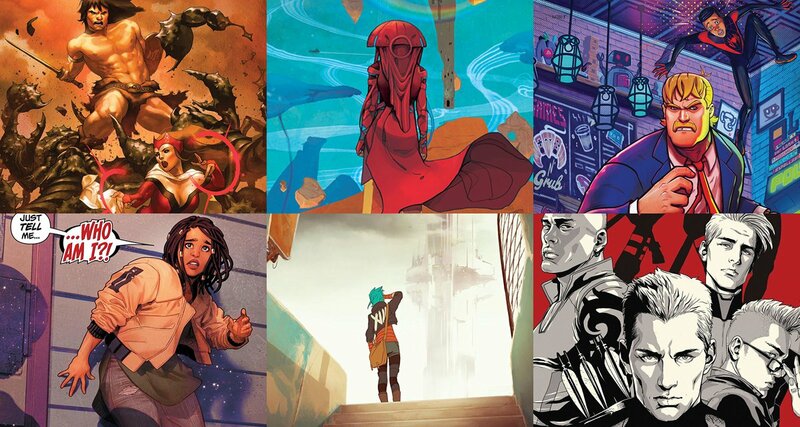 The art is beautiful and coolly futuristic and the convent scenes reminded me of Moebius. This is what it might be like if Amazon and the Catholic church controlled the world in real life. Do the creators of this comic book know something that we don’t? 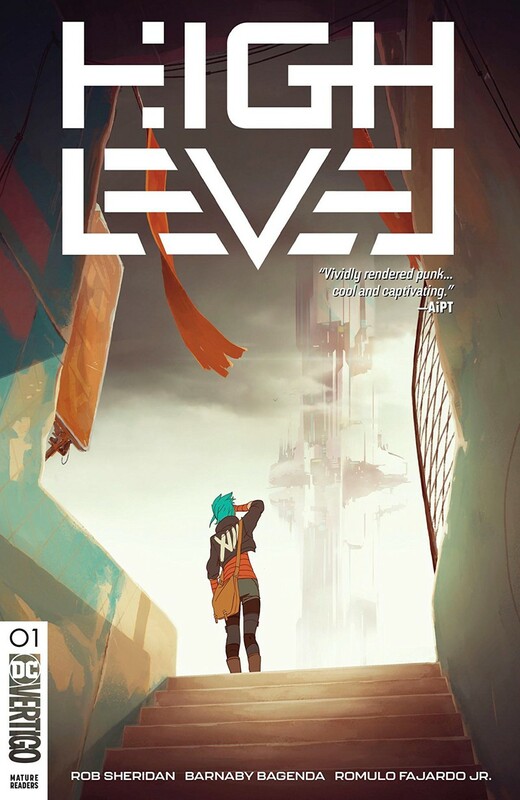 High Level #1 –Rob Sheridan (writer) Barnaby Bagenda (pencils) Romulo Fajardo Jr. (colours) Nate Piekos (letters). Here’s another new sci-fi comic book that I snagged to read because I liked the art. The story about a young girl who could save the world from war is okay but the telling of it wasn’t done very well. It’s not good that I got majorly confused twice and had to flip back pages to see if I missed something. The first time was the artist’s fault. One panel shows a character with hair covering the right side of her head and three panels later that side of her head is bald. The door panel of the vehicles she’s driving didn’t match so I thought it was two different women. Then I got sidetracked again when the little girl talks about someone named Ezra helping them on page 19. I’m thinking who the heck is Ezra? Turns out it’s a robot that first shows up on page 7. Why didn’t they name the robot then? I found these things so annoyed me that I didn’t want to continue reading. I didn’t care enough about little Minnow or her protector Thirteen. Marvel’s Spider-Man: City at War #1 – Dennis “Hopeless” Hallum (writer) Michele Bandini (art) David Curiel (colours) VC’s Travis Lanham (letters). How could I not grab this to read with its gorgeous cover by Clayton Crain? 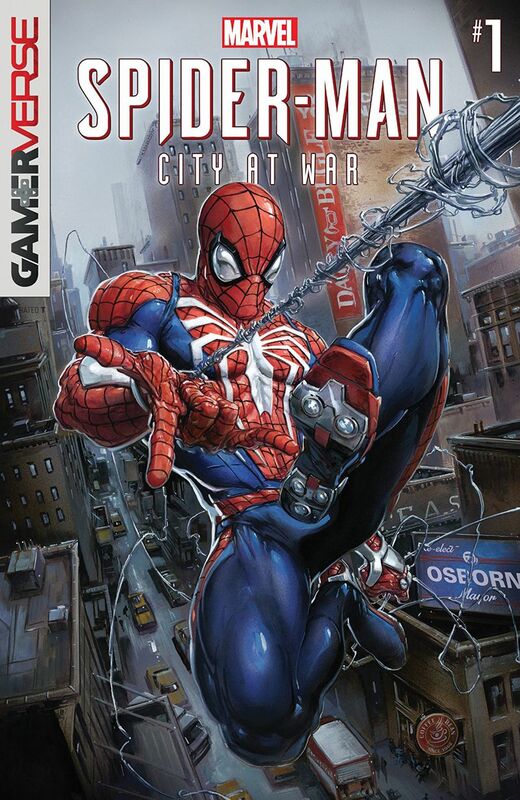 Welcome to the Gamerverse version of Spider-Man where it’s eight years after Peter first dons the costume. In this universe Otto Octavius isn’t Doc Ock yet and Peter is his research assistant. Otto even helps Peter design a spiffy new costume. 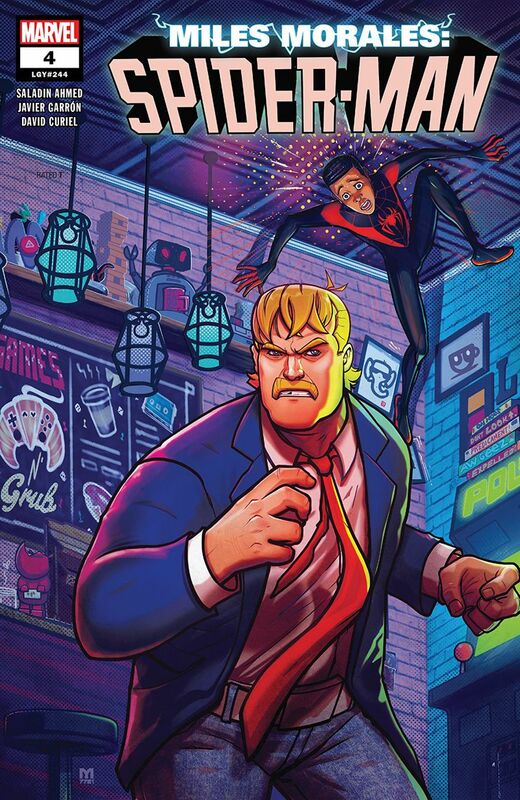 Peter fights the Kingpin who is not the mayor of New York City and I have to say that if the animators had modelled their Kingpin after this version I would have enjoyed Into the Spiderverse a whole lot more. Mary Jane knows Peter’s secret and she’s a reporter working for the Daily Bugle. Mister Negative is another major villain in this story and he’s the one that will be featured in the next issue. 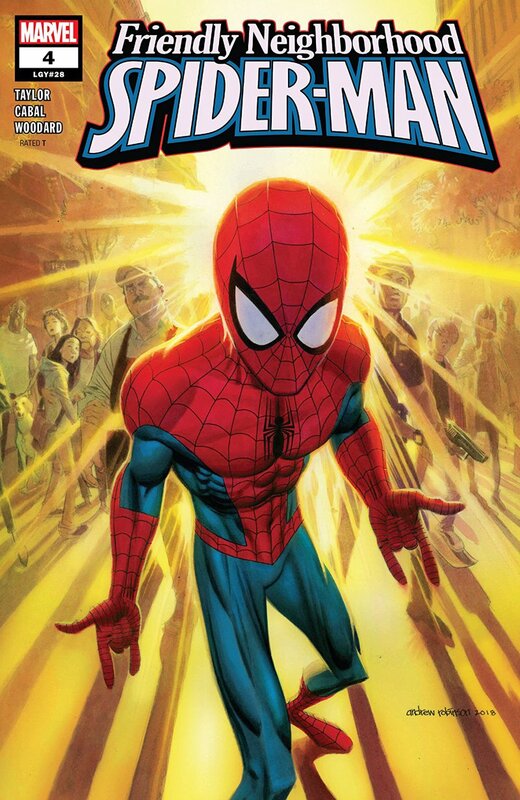 I’m not a video gamer so this alternate version of Spider-Man doesn’t mean a lot to me so this new book is not for me. 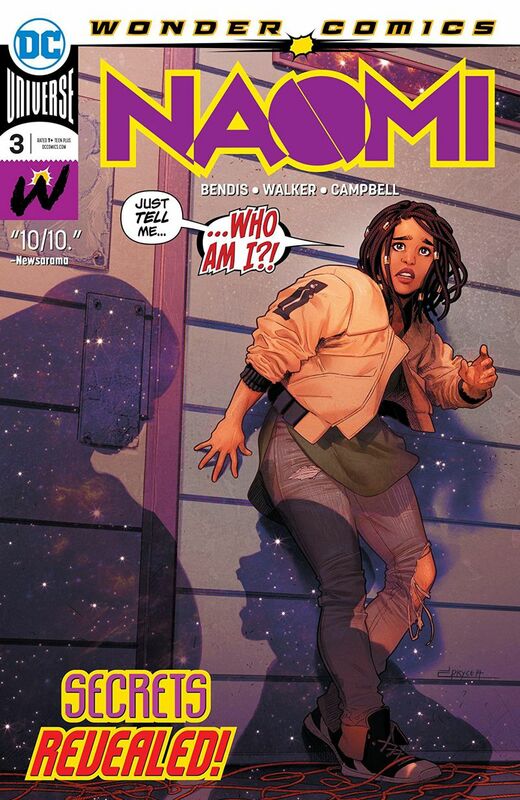 Naomi #3 – Brian Michael Bendis & David F. Walker (writers) Jamal Campbell (art) Wes Abbott (letters). There are so many great twists as the mystery of Naomi’s origin is slowly being revealed. I loved the dad bod on the last page. I’m guessing she’s from Rann going by the costume her father is wearing. West Coast Avengers #9 – Kelly Thompson (writer) Gang Hyuk Lim (art) Triona Farrell (colours) VC’s Joe Caramagna (letters). Dang, I missed the last issue so I don’t know how most of the team was captured by a vampire cult. This rescue issue was tons of fun and there’s a major change to one of the characters. The last page cliffhanger means that I won’t want to miss reading the next issue. Miles Morales: Spider-Man #4 – Saladin Ahmed (writer) Javier Garron (art) David Curiel (colours) VC’s Cory Petit (letters). I love what they’re doing artistically with this book. The double page spread showing how Miles and his friends get back to school was cool and super cute to boot. This is a great one issue story about Miles playing hooky if you want to see how good this comic book is. Meet the Skrulls #2 – Robbie Thompson (writer) Niko Henrichon (art) Laurent Grossat (colour assistant) VC’s Travis Lanham (letters). 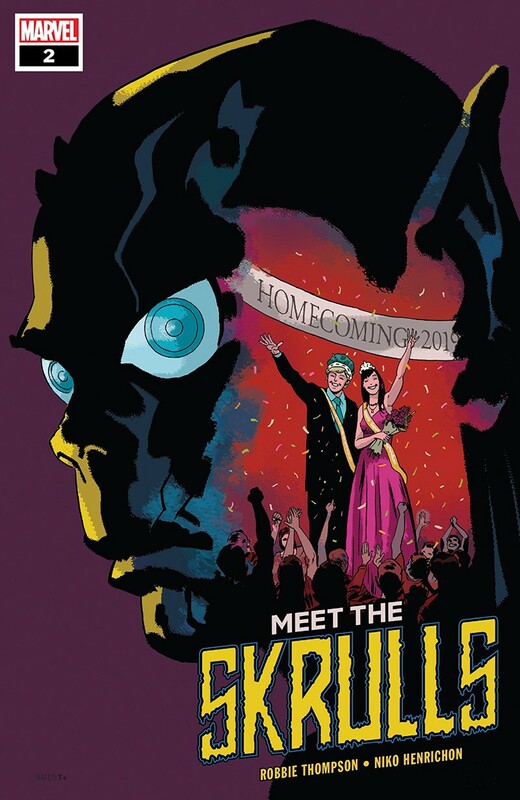 This issue shows a little origin story for this Skrull family and more of them achieving their mission. That is until the Skrull killer shows up. I need to find out who is going to die next issue. 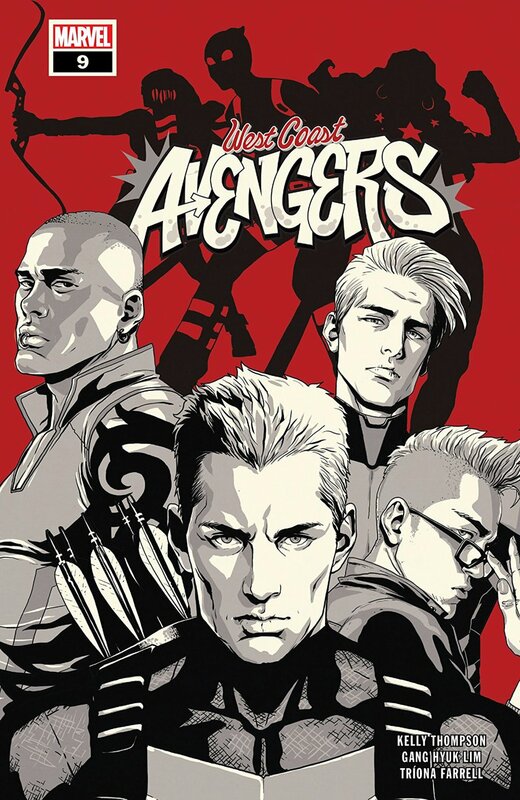 Avengers LGY #713: No Road Home #6 – Jim Zub, Mark Waid & Al Ewing (writers) Sean Izaakse (art) Jay David Ramos with Marcio Menyz (colours) VC’s Cory Petit (letters). 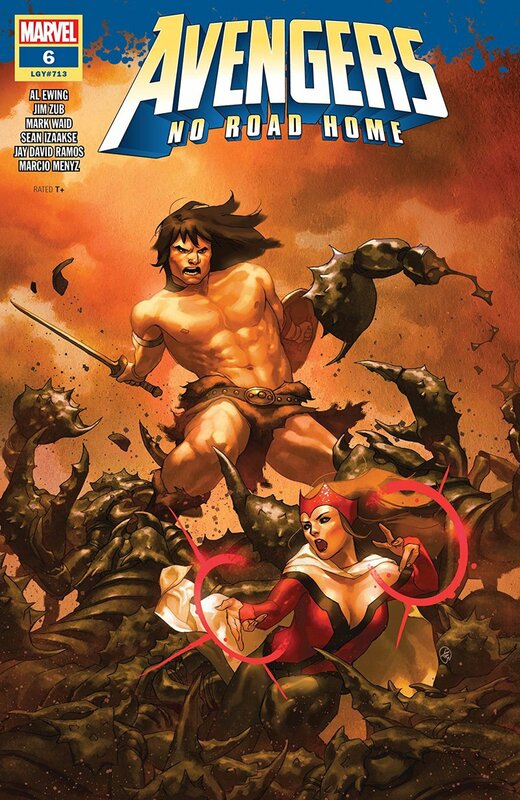 Can you believe a team-up with Conan and the Scarlet Witch? Believe it True Believer. Wanda and the brawny barbarian wander the desert in search of one of the Shards of Night. Their journey leads them to Shadizar where priests use the shard to summon their dark god. They don’t worship Nyx but that’s who shows up. Meanwhile, the Hulk has a shard as well and it’s quite a surprise what he does with it. Friendly Neighborhood Spider-Man #4 – Tom Taylor (writer) Juann Cabal (art) Nolan Woodard (colours) VC’s Travis Lanham (letters). Mother of Exiles part 4. The evil overlord of the underground city invades New York to retrieve his heir. You won’t believe who saves Manhattan. This was a great first story and the next one looks like another doozy. This is my favourite Spider-Man title right now not just because of the beautiful art but because Tom King knows how to write Peter Parker and Spider-Man to make him fun and serious too.